I got a view of the future when I visited HP’s Innovation Center in Barcelona, Spain, last week. The company has made some aggressive moves to blend its printing and imaging technologies to create products that will redefine our near-term future. HP also showcased capabilities that are something just short of magic. I mean, when you can transform what you can imagine into physical products, what else would you call it? I’ll share some thoughts on what that could mean for us, and I’ll close with my product of the week: a running shoe shown off at the HP event. Called the “Brooks Genesis,” it could revolutionize both recreational and professional sports — not just running. One of Arthur C. Clarke’s famous laws is that technology that is advanced enough will appear to be magic. What I saw last week in Barcelona came really close. You see, HP showcased two technologies that can be used in combination to create physical products from imagination. These products increasingly have become usable as printed complex mechanical products — not just parts. The potential to use metals, blended metals and blended electronics is on the horizon. Most of the 3D printers in the market produce parts that can’t be used for anything but prototyping. The result can be visually compelling, but the materials used just don’t compare, in terms of strength, to any other form of manufacturing. The printers that do produce usable parts tend to be really expensive, and they produce parts only at relatively low volume. For instance, a few years back, a firm demonstrated that it could 3D-print a 45 automatic. It was impressive both because it worked and because it cost around 20x more than a traditionally built gun. HP’s Jet Fusion 3D printer produces parts that are competitive with metal alternatives in many cases and both cost and weigh less than one-tenth what those alternatives cost (at low volumes). This means the parts can be used not only for cost-effective prototyping but also for short-run and custom production offerings. The range of products that the printers can produce is pretty impressive and uniquely effective. For instance, you can print a car intake that fully takes into account air dynamics, customizing the air flow to uniquely match the race track, driver, and potentially even weather conditions. This is something no other method could even approach because you can use fluid modeling to set the design before sending it to the printer for production. Orthotics and prosthetics can be computer-generated to provide a unique match for individual users. Helmets can be printed to custom conform to users’ heads. Parts to fix aging out-of-production equipment can be produced on the fly and installed to keep that equipment in service long after those who built it are dead and gone. One interesting thing I learned about the bike helmets is that currently the more expensive the helmet, the less protective its is. With these 3D printers, bike helmets are being created that are not only very light and comfortable, but extremely safe as well. I should add that his printer technology allows for the plastic used to be either soft or hard, so you can print the custom-fitted helmet and liner at the same time if you like. The only thing you need to add are the straps. Currently the HP 3D printers in use have produced 3.5M parts — 50 percent of which have been used in production products. HP has more than 65 resellers and more than 25 experience centers showcasing its offerings. The latest — the 300/500 printer — will print in color. Inside it has 140 3D-printed parts itself. Among the things HP demonstrated at the Barcelona event was its commitment to virtual reality, and how aggressively tools like its Backpack PC and workstation were being used both to create and showcase products. With the VR headset and backpack workstation you could, with design software, mold products in 3D space. Then you could interact with those products, refining them and even running them through software emulators to get a feel for how they would function. Finally, you could use the setup as a sales tool to help customers choose the version, color and accessories of the product before it was ordered and produced. Granted, as with every similar product, there needs to be additional advancement on the controllers, so hands can be instrumented for a more natural feel. Also, HP is working to create more industrial headsets. Still, the experience was pretty amazing. However, it is when you consider blending HP’s VR and 3D-printed solutions that things start to get really interesting. It currently is the only firm that has tools that can render and print VR images. This means an engineer can create and virtual-model something, and then send it to a 3D printer to transition it from the virtual to the real world. This potential end-to-end solution is years in advance of anything else in market at production scale. Granted, the size is limited to the printer capability, and the process is far from instantaneous, but speeds will increase, and larger printers are in demand by HP customers, so it won’t be long until almost anything you can render, you’ll be able to print. HP has a set of potentially revolutionary technologies that, when combined, could redefine how we build physical products. I think the company is underselling substantially the potential for these groundbreaking offerings, and HP’s potential is about to expand even further. It hinted at future products that could use metals and even blend metals and plastics to create far more capable products in the near-term future. We are getting closer to the magic of that Star Trek replicator, and HP just demonstrated that this future is far closer than we ever thought it could be. I used to be a runner, but thanks to a combination of bad practices — including using bad shoes — I had to give it up. Part of the problem for a lot of us is getting shoes that truly fit. You can get orthotics, but they don’t take into account anything but the bottom of your feet. They are expensive, and they really don’t take into account the biomechanics of your body (your stride, etc. ), which makes a difference. Well, in conjunction with Superfeet, HP has created a scanner called the Fitstation, which creates a full 3D scan of your foot. This solution, which has been adopted by the NFL, dramatically improves the matchup of feet to existing running shoes, and can produce custom orthotics that further match the shoe to your unique capability. However, Brooks at the HP event announced it was taking this one step further, and it showcased its new Genesis line of running shoe, which would be custom matched to your feet. I don’t expect this to be a cheap date, but I had my feet scanned, and it turns out, that like many, my right and left feet don’t match up that well. I basically need a very different shoe for each foot. 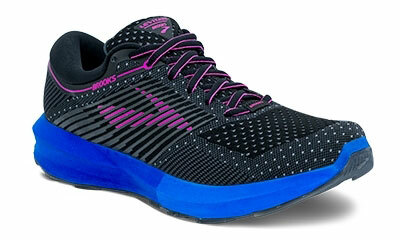 Well, with the Fitstation, the Brooks basically would build me a custom shoe for each foot. I expect that if I’d had these years ago, I likely would have been a ton faster, and I might be running still today.